The Exploratorium at Pier 15 in San Francisco has attracted an enormous eye-catching exhibition that's sure to be an attention-grabber. SAN FRANCISCO (KGO) -- The Exploratorium at Pier 15 in San Francisco has attracted an enormous eye-catching exhibition that's sure to be an attention-grabber. These things are called Strandbeest, that's Dutch for beach animals. They are intricate wind-powered kinetic creations made of PVC tubing and other hardware store materials. This summer, an exhibit will open at the Exploratorium dedicated to these magnificent creations. The artist treats them as real animals with a life span. "They have to survive the storms the water the sand. There have been many generations of strandbeest. It's an evolution process," said kinetic artist Theo Jansen. The exhibit is on tour for the first time in North America and its first stop is the Exploratorium. It will be on display beginning next Friday, May 27 until Sept. 5. 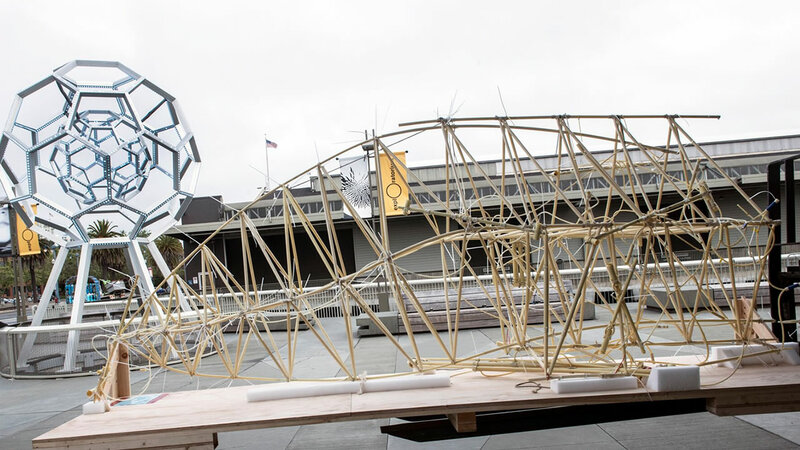 Click here for a list of Strandbeest events. ABC7 News is a media sponsor of this exhibition.